I have Fridays off, so usually that’s my day for exploration – sometimes with a companion, sometimes not. This week, I went into Ginza to meet someone for yakitori. I arrived there with two and a half hours to spare, so through thick humidity and heat, I wandered down to Hama-rikyu, known in English as the Detached Palace Gardens. That’s a reference, I believe, to the Imperial Palace twenty minutes to the north; Hama-rikyu was the emperor’s duck-hunting and tea-sipping retreat. Begun in 1654 by the Tokugawa family and finished over a time period encompassing about 6 Shogun, then sequestered by the Emperor after the Meiji Restoration, the whole thing was destroyed last century: first by the Great Kanto Earthquake, second (and most completely) by bombing during World War II. 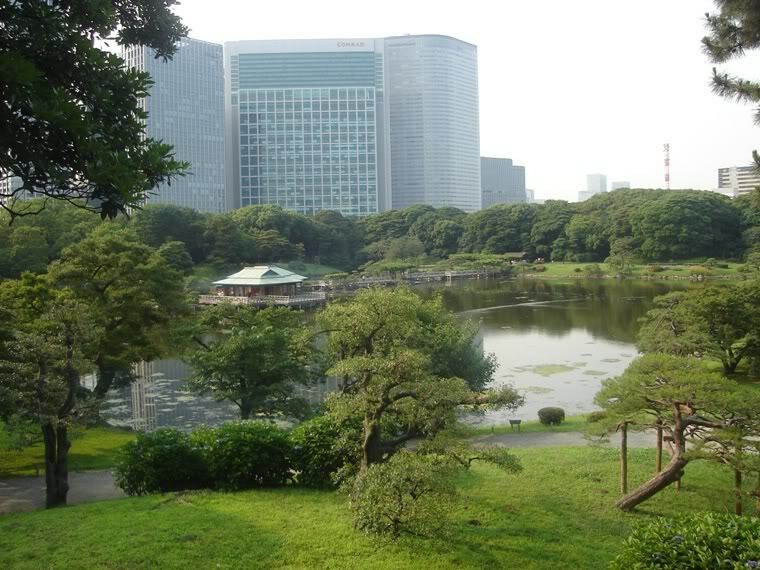 The City of Tokyo was then given the garden by the Emperor (that strikes me as rather hollow: “Okay, everybody, we’ve enjoyed this beautiful park for hundreds of years and kept you out of it, but now that it’s decimated… here you go!”), which restored it – within about a year – to its former glory. 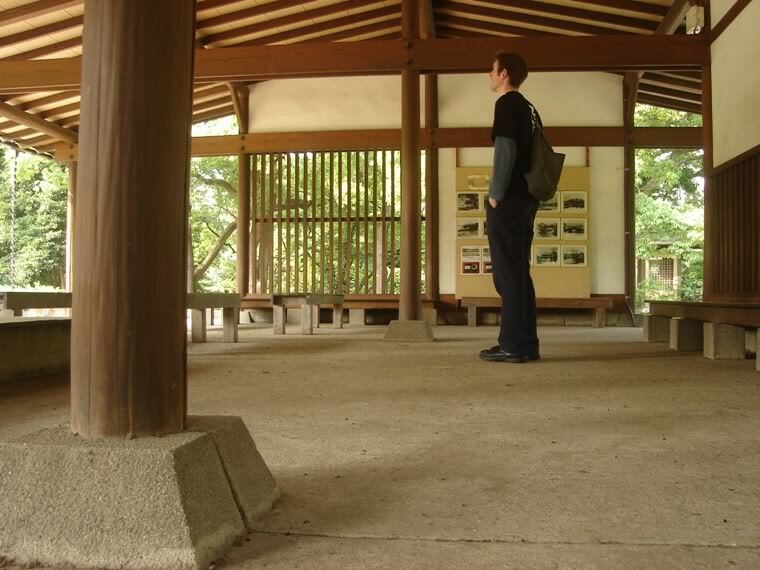 So, as I ambled through grassy meadows, sat contemplatively in rest houses, and admired the view from the Nakajima tea-house, the historical significance of it all was more a product of my imagination than actual, tangible evidence. However, the Japanese are exceptionally good at rebuilding things to look exactly as they would have. Some shrines were built to symbolize regeneration, so they are torn down and rebuilt brick-for-brick, board-for-board every 20 or 50 years or something. And of course, the war left a trail of destruction right across the country, so a good number of the country’s important sites are in fact copies of the real, vaporized thing. This garden, then, looked authentic enough, but the knowledge that it basically wasn’t couldn’t be pushed from my mind. While the noise of the city and the shadows cast by its buildings cannot be completely escaped, its filthy air can. I’d almost forgotten what it feels like to inhale a lungful of fresh air, so entering this tree and grass-filled delight was like stepping out of my new life and back into my old one. I breathed deeply and felt… well, regenerated and energized afterwards. 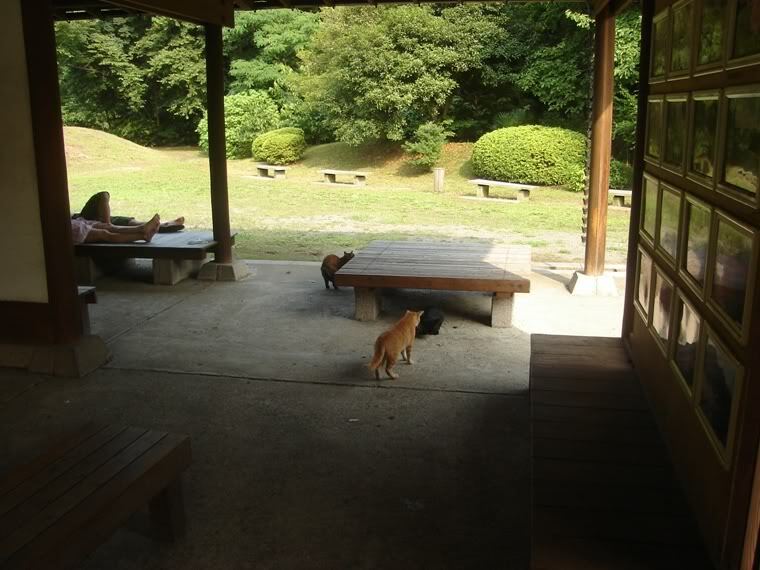 Plus there were resident cats, which always delights me (though the enormous flying insects don’t). Tokyo needs more places like this. I also cannot escape New Zealand. I had a bit of free time at Yokohama the other day, so I was chilling out in the teachers’ room reading my handy guidebook (thanks again, Nic and Mami). Suddenly, I was forced to look up from the book and listen intently to the music coming from the lobby PA. Normally I would avoid doing this at all costs, as it is invariably pumping out swill like The Black Eyed Talentless Pricks or Destiny’s Satan-Child, but not this time. No, it was the dulcet tones of Bic Runga. Turns out it belonged to one of the staff members, who spent three years at high school in New Zealand, and actually lived just down the road from me in Riccarton. We probably saw each other at some point or another. 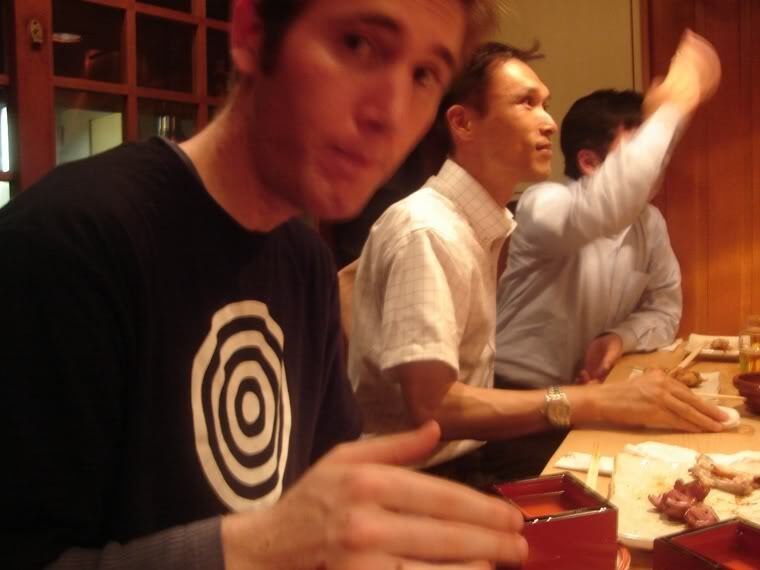 This, combined with seeing my old flatmate’s picture on hundreds of Fujifilm photo-printing machines in Shinjuku, makes me think I know everyone in the known universe. Even if they don’t know me. Or prefer not to know me, since the spaghetti incident. Look, I said I was sorry and I meant it, okay?